If you must unexpectedly cancel class (due to illness, family emergency, etc. ), notify your students via email as soon as possible. Your syllabus should specify that notification of cancellations will be made via email. In addition to notifying your students, you should let the Associate Director of the Writing Program know as soon as possible when you need to cancel class. The University strongly encourages all students to finalize course selections before the first day of classes. Nevertheless, students may still drop or add a course, or specify audit or pass/fail status using UDSIS through the free drop/add period (the first 10 days of classes in the fall and spring semesters, or during the first four days of winter and summer session classes). Students should consult with their advisors before making any registration changes. To add courses after free drop/add, students need approval from the instructor and the appropriate college Assistant Dean. Other registration changes are permitted until the Academic Penalty Deadline, at the end of the eighth week of the semester or comparable period in winter and summer. Students will receive a grade of “W” unless they withdraw from a course during the free drop/ add period. The University offers no tuition refunds for registration changes made after this period, and students who make late changes must pay a one-time $25 fee. In case of a psychological emergency, help is available 24 hours a day when school is in session during the fall and spring semesters, as well as the Winter Session. For emergencies during regular business hours, contact the Center for Counseling and Student Development (302-831-2141). For emergencies in the evenings, or on weekends, contact Student Health Services (302-831-2226). In case of dire emergency involving the safety of someone, University Police should be contacted. The Center for Counseling and Student Development may then be asked to provide assistance once immediate safety is secured. What is the role of the faculty in assisting students who have problems? The stress of academic, social, family, work, and/or financial concerns are often interrelated and may result in a student turning to faculty members for help. In fact, anyone who is perceived as knowledgeable, caring, and trustworthy may be a potential resource in times of trouble. Faculty members are often in a good position to identify students who are troubled. Timely expressions of interest and concern may be critical factors in helping students solve problems that are interfering with academic survival and success. Not every student needs professional counseling. Sometimes simply listening and offering encouragement and empathy can help a student feel understood. If you want to let a student know that his or her concerns are normal and expected, be sure not to minimize the problems in doing so. What is a simple solution in your view may be harder to imagine for another person. When a faculty member determines that a student might benefit from professional counseling, it is usually best that the student be spoken to in a direct, straightforward fashion in which concern for his or her welfare is shown. It is recommended that faculty make it clear that this suggestion represents his/her best judgment based on observations of the student’s behavior. Specific feedback about behaviors of concern is recommended. Above all, it is not advisable to attempt to deceive or trick the student into seeking counseling. Except in emergencies, the option must be left open for the student to accept or refuse counseling. If the student is skeptical or reluctant, simply express your acceptance of those feelings so that your own relationship with the student is not jeopardized. Give the student an opportunity to consider other alternatives by suggesting that he or she might need some time to think it over. If the student emphatically says “no,” then respect that decision, and again leave the situation open for possible reconsideration at a later time. If the student agrees to the referral, you may call the Center for Counseling and Student Development (831-2141) to make an appointment. In some cases, the student will prefer to make the appointment. In either case, the student’s first contact with the Center will be a screening interview in which the student and the intake counselor make decisions about the type of help needed. Intake appointments are usually scheduled within a day or two of the student’s request to be seen at the Center. Students requiring immediate help are seen on an emergency basis. You should follow up with the student at a later date to show your continued interest even if he or she did not accept your attempted referral. It is important for members of the University community to understand that the interviews conducted at the Center are confidential in nature. Information about those interviews or the content of such interviews cannot be released except upon a student’s written request, in circumstances which would result in clear danger to the individual or others, or as may be required by law. The Center for Counseling and Student Development adheres very strictly to this policy. If a faculty member is interested in a student’s contact with the Center, information can best be obtained directly from the student. It should be noted that students are not bound by the same promises of confidentiality that professional psychologists are obliged to keep. In some instances, a student may want the Center to share certain information with a faculty member. This can be done by the student giving the Center a written authorization which specifies the purpose and the content of such a disclosure. People seek counseling for many reasons, ranging from a wish to solve a long-standing problem to a desire to enhance their personal growth. To address the personal, educational and career concerns of the students, the Center offers both group and individual counseling. Students come in to discuss issues such as roommate conflicts, anxiety and stress management, depression, eating disorders, career choices, and family concerns such as divorce and alcoholism. Students may also receive psychiatric services if medication is considered essential to the treatment of their concerns. Fundamental or traumatic changes in personal relationships — such as death of a family member or friend, divorce or separation in the family, or pregnancy. Significant changes in mood or behavior — such as withdrawal from others, asocial activity (e.g., lying, stealing), spells of unexplained crying or outbursts of anger, or unusual agitation. References to suicide — since it is difficult to distinguish between serious threats or passing idle thoughts of suicide, judgment about the seriousness of a situation is best made in consultation with a psychologist or psychiatrist. Anxiety and depression — these are two of the more common symptoms which can significantly impair a student’s functioning. Psychosomatic symptoms — concerns such as tension headaches, loss of appetite or excessive eating, insomnia or excessive sleeping, or chronic stomach distress, etc. Alcohol and drug abuse — evidence of excessive drinking, drug abuse, or drug dependence is almost always indicative of psychological problems. Career choice concerns — often these concerns reflect the student’s struggle to understand him/herself and the world of work. Sometimes it reflects a problem with decision-making in general. Concern about academics — such as contemplating dropping out of school, worrying about possible academic failure, or considering a transfer to another school. Contributes to the local community through writing-related community service. Ultimately, the writing center is a place where all UD students can come to write and to talk, think, and learn about writing. Writing Program instructors should encourage students to use the Writing Center both by including the required clause in their syllabus and by scheduling a class visit. To support faculty members interested in improving their students’ writing skills, tutors from the University Writing Center are available to give a short class visit about Writing Center services. These 5-10 minutes presentations include information on the one-on-one writing instruction services offered at the center and an explanation of how to use information gained during the writing conference to guide the revision process. Instructors may schedule class visits on the Writing Center website. The Writing Program encourages instructors to recommend the Writing Center to students. However, instructors may not require their students to go to the Writing Center, nor should they give extra credit to students who do so. Additionally, the Writing Center may not be used as a substitute for a missed Peer Review session. Graduate TAs who work in the Writing Center may not tutor their own students. At the end of each term, grades are reported to students electronically. Grades are available through the UDSIS Personal Access website. The University uses a system of letter grades with plus and minus designators. Students in English 110 must receive at least a C- to pass; those who do not earn at least a C- must retake the class. Additionally, students who were admitted as freshman to UD and are in their first or second UD semester have a mid-term grading period during the Fall and Spring semesters. This means that E110 instructors must submit midterm and final grades through the UDSIS system. Instructors of upper-level writing courses need only to submit final grades. In addition to the standard range of grades (A, A-, B+, B, B-, C+, C, C-, D+, D, D-,F), instructors may enter “I” for “Incomplete” (see below) or “Z” for “Unofficial Withdraw” for students who never attended or stopped attending. Rosters will be available beginning approximately one week prior to the last day of classes. Grades must be submitted 72 hours after the final exam. If no exam is scheduled, the grade submission deadline defaults to the due date listed the academic calendar. Faculty may access their online grading rosters via the UDSIS Faculty Center. Access UDSIS. Sign on with your UDelNetID and password or UD ID and PIN. 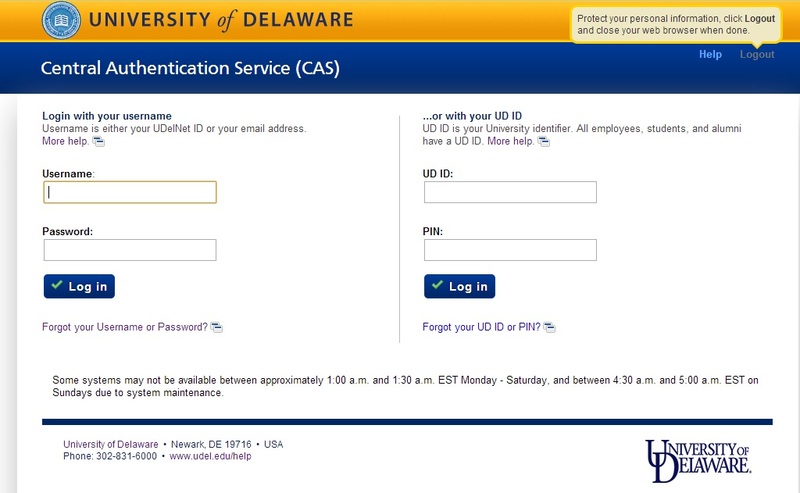 If you do not know your password, go to http://www.udel.edu/network, logon with UD ID and PIN on the right side, and you will be able to change your password. 2. Under the “Self Service” folder on the left side menu, click on “Faculty Center.” A list of your courses for the current term will appear. To select a different term, use the Select Term dropdown box, and click the Change button. 3. Click on the Grade Roster icon next to the course you wish to grade. A new screen with the roster will appear. Do nothing. Allow the grade to default to “F”. Submit an Incomplete Grade Explanation, providing an alternative to the default “F”. Submit an Incomplete Grade Extension, extending the default deadline to allow the student additional time to complete the work. Incomplete Grade Explanation and Incomplete Grade Extension requests are available in your UDSIS Faculty Center in the “Forms” folder. Students can petition for a change of grade with the instructor. See the Grade Grievance policy in the Student Guide to University Policies. If you find an instance of plagiarism or other academic dishonesty in a student’s writing, follow the below steps, as outlined by the Office of Student Conduct. Note: if you are unsure whether or not something constitutes plagiarism, contact a Writing Program Administrator. Review the material to ensure that there is sufficient evidence to warrant a charge of academic dishonesty. Meet with the Associate Director of Writing or the Director of Writing to determine the best course of action. For cases involving multiple students, the faculty member may choose a different option and/or academic penalty for each of the students. Meet with the student to inform him/her of the pending case of academic dishonesty. Let the student know that the Office of Student Conduct will be in contact with him/her. The faculty member should continue to work with the student on course work. Provide Michael Fernbacher with a short letter or relevant information in order to start the disciplinary process. (In a plagiarism case, materials should include a copy of the student’s work and a copy of the text or website that the student’s work matches. In a cheating case, materials should include a copy of each student’s work, the student getting the help as well as the person giving the help.) Please make every effort to provide the case materials within five (5) days of identifying the alleged violation. Assign the student an “I” grade until case is resolved. After the case materials arrive in the Office of Student Conduct, the student will receive a packet of information from the Office. The student will be informed about the allegation, provided with a copy of the case materials along with the letter submitted by the faculty member, and recommended sanctions. If the student accepts responsibility for the violation, the case is closed and the penalties go into effect. If the student contests the case, the faculty member will need to participate in the administrative hearing process. The Office of Student Conduct staff will review hearing procedures with you. All syllabi must be distributed to students only online. No print copies. We will no longer be using University Printing for classes. Additional printing for classes will be limited to 250 pages per class. All class resources should be distributed to students through email or an online platform. Please do not use department printers to print out numerous or long (or numerous long) documents. The Writing Program takes course evaluations, and particularly student participation levels, seriously. Instructors should strongly encourage students to fill out evaluations, both by sending students a link (http://www.udel.edu/udsis-students/courseevaluations.html) via email and by reminding them in class. – The Composition Program does not “pre-approve” courses for ENGL110 transfer equivalency.- Credit for ENGL110 cannot be gained from AP exams in English or through dual or concurrent enrollment. Once you have confirmed that the transferred English coursework is on your UD transcript, you may petition for ENGL110 exemption review for transfer courses that are comparable to UD’s ENGL110. To qualify for exemption, the course must be a rhetoric/writing and composition course studying primarily non-literary sources. To request an ENGL110 transfer exemption review, you must complete an online application and upload supporting documentation. Before starting this process, be sure to have electronic versions of the items listed below readily available. Once you have these documents at hand, click on the link below to initiate the ENGL110 transfer exemption review request. – Your unofficial UD transcript (PDF);- Complete syllabus for the course you took (PDF);- Course description from the course catalog (PDF); and- A brief paragraph describing the course you are requesting to be reviewed, and explaining why you think the course is equivalent to UD’s ENGL110.